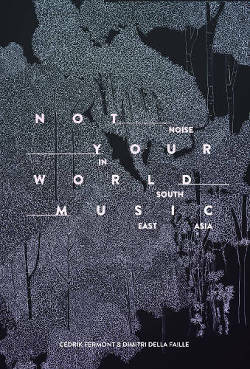 From academic electronic music to do-it-yourself noise in South East Asia. Contemporary and past noise, electroacoustic, industrial, experimental music and sound art in Cambodia, Indonesia, Laos, Malaysia, Myanmar/Burma, The Philippines, Singapore, Thailand, Vietnam. With political, historical and sociological essays, exclusive interviews with artists and organizers, as well as an extensive bibliography of popular music from South East Asia and a thorough discography of noise and experimental music artists. And more... get the book here. Born in Zaire (Democratic Republic of Congo) in 1972, Cedrik Fermont, known as C-drík or Kirdec, is an artist based in Berlin (Germany). C-drík grew up mostly in Belgium but has lived in the Netherlands and up to this day in Germany. He started his first industrial and noise band, ÄŒrno Klank, in 1989. He studied electroacoustic music in Belgium, under the direction of Annette Vande Gorne in 1997. He is active solo and in several music projects such as Axiome and Tasjiil Moujahed and has collaborated with dozens of musicians from the free improvised, noise and electroacoustic music scenes. He is the manager for Syrphe, a platform and label mostly but not exclusively focused on alternative electronic, noise and experimental music from Asia and Africa. C-drík has extensively toured Asia (including the Middle East), North Africa, Europe and North America. He also collaborates with Radio Staalplaat in Berlin in order to present electroacoustic, noise and experimental music from Asia, Africa and Latin America. Born in Belgium in 1973, Dimitri della Faille, known as Szkieve, is an artist and a scholar based in Ottawa (Canada). He is a tenured professor of international development with the Department of Social Sciences at the Université du Québec en Outaouais. He received a graduate diploma (Masters) in sociology from the Université Libre de Bruxelles (Belgium) and a PhD in sociology from the Université du Québec à Montréal (Canada). He has also studied arts and cultural management at the graduate school of école des hautes études commerciales (HEC-Montréal) and social, political and communication studies at the Facultés Universitaires Notre Dame de la Paix in Namur (Belgium). Dimitri grew up in Belgium, but he has also called New York City, Buenos Aires and Mexico City home. He has been a visiting scholar or invited professor at the University of the Philippines Baguio (The Philippines), Chiang Mai University (Thailand), Universidad de Buenos Aires (Argentina), Universidad Autónoma Metropolitana Azcapotzalco (Mexico), Université Libre de Bruxelles (Belgium), Université de Bretagne Occidentale (France), McMaster University (Canada) and the New School University (United States). As an experimental musician, Dimitri has been active since 1997. Since then, he has extensively toured Asia and Latin America. In 1998, he founded the independent record label, Disques Hushush, from which he has released about 25 CDs and vinyls from experimental and noise artists from Europe, Asia, Latin America and North America.